Fab review by Neil McKim for BBC Music Magazine of the Nu Civilisation Orchestra concert –Parallel: A Tribute To Joe Harriott at St George’s Bristol on 10 October, and opening support,Bristol Reggae Orchestra. Courtesy of Classical-music.com – The Official website of BBC Music Magazine. Originally published 12 October 2012. A Radio 3 jazz presenter Geoffrey Smith wrote in the magazine last year that ‘Maybe 2012 will be Joe Harriott’s year’ – following the timely release of a CD box set, celebrating the career of this often overlooked, but extremely gifted, saxophone player from Kingston, Jamaica, who settled in Britain in the 1950s and died in 1973. Harriott’s diverse career took in established jazz forms, writing for the likes of trombonist Chris Barber, [Spotify link] to his own ‘free form’ jazz experiments and the later ‘Indo-Jazz’ crossover LPs with John Mayer. It’s tragic that he died so young, aged just 44. And the interest is growing. 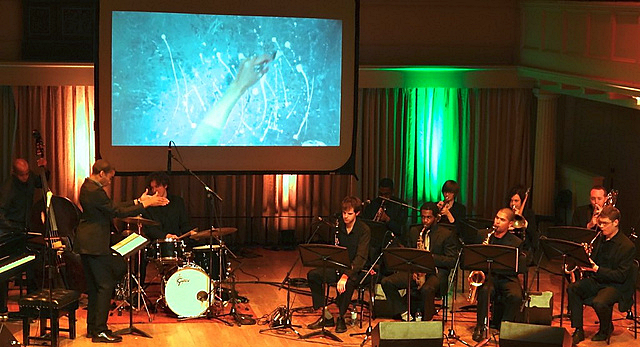 Joe Harriott’s music is currently being showcased in concerts across the country, as part of the Lively UP! Festival, which marks 50 years since Jamaican independence. I went along to the Bristol leg of the celebrations, hosted by St George’s earlier this week. The first half, delivered by The Bristol Reggae Orchestra, a (going on) 30-piece band with strings, brass, woodwind and a pulsing rhythm section, definitely set the scene. The band drifted through tunes ranging from Nat King Cole to reggae hits by Freddie MacGregor and Delroy Wilson. And this feel-good community band had people dancing and swaying in the aisles of this converted church. By way of contrast, the second half showcased two of Joe Harriott’s ‘free form’ jazz albums from the early 1960s, ‘Free Form’ and ‘Abstract’, which had been expertly re-arranged by pianist Peter Edwards – from the original five-piece to an 11-piece line-up. The band, the Nu Civilisation Orchestra has some excellent UK jazz talent, including trumpeter Byron Wallen and alto saxist Nathaniel Facey in its ranks. And introducing the programme, Edwards explained how Harriott saw the sounds of ‘free form’ jazz as ‘equivalent to brush strokes on a painting’. To illustrate this, a screen behind the band showed film footage of visual artist Emma Godebska, creating paintings, while it played. The result was fascinating and genuinely illuminating, as we were treated to the challenging soundscape of Harriott’s ‘free form’ jazz. And this was no safe option for some of the audience. The arrangements moved from tumbling bebop, plunging into shuddering grooves and at times squawking cacophony, interspaced with calypso, blues, swing and myriad influences – with all concerned demonstrating why they are at the top of their field. At the start of the concert, Lively UP!’s executive director Janine Irons, announced: ‘We’re going to be celebrating the great Joe Harriott – a great musician that a lot of people don’t really know about.’ I certainly learnt a lot about Harriott’s ‘free form’ jazz and I hope that this project triggers future performances of his wider output and re-releases of some of his great records, such as the incredibly rare Hum Dono (1969). There’s another chance to catch A Tribute to Joe Harriott at the RNCM Theatre in Manchester on Saturday 20 October.